Affleck's lanky, offhand softness hardly suits the superheroic archetype... [but] The R-rated Director's Cut...deserves an extra half-star. 96 min. 20th Century Fox. Director: Mark Steven Johnson. Cast: Ben Affleck, Colin Farrell, Jennifer Garner, Michael Clarke Duncan, Jon Favreau. Mark Steven Johnson is the writing-directing auteur behind the critically maligned, sappy Simon Birch (a bowdlerization of John Irving's A Prayer for Owen Meany). But having only a gentle character drama to his credit did not necessarily mean he couldn't handle Daredevil, the latest action-packed adaptation of a beloved Marvel superhero comic book. No, Johnson couldn't handle Daredevil because he is a bad director. Let's be fair, people. Johnson's affinity for the tale of Matt Murdock--blind lawyer by day, red-leather-cowled vigilante by night--comes through loud and clear, but so does his lack of aptitude to develop a story with something more than shorthand plotting, wildly divergent tones, and incomprehensible action. Ben "Please Don't Mention J. Lo" Affleck stars as Murdock, who narrates flashbacks to his unusual childhood, capped with a chemical accident which rendered him blind but super-sensory, and a traumatic death in the family. Murdock grows up to be a lousy lawyer who mostly intones vaguely threatening witticisms at the accused (like "Justice is blind"). But he also grows up to be Daredevil, a pretty good superhero, so it all works out. One fine day, the "man without fear" meets Elektra Natchios (Jennifer Garner), a mysterious but stunning kickboxing fiend. This rather absurd first meeting goes from testy banter in a cafe to love at first fight as the two wail on each other in a schoolyard filled with curiously unfrightened children (hooray for audience surrogates!). Crime lord Wilson Fisk--a.k.a. Kingpin (Michael Clarke Duncan)--has the rest of New York squirming, and he, too, seems above Murdock's law...but not the law of the streets! Kingpin hires legendary Irish hitman Bullseye (Colin Farrell) to kill off the offensive Natchios family. Bullseye sports a bullseye-shaped brand on his forehead and has a Magyver-like enthusiasm for killing with whatever's around: paper-clips, pencils, pretty much anything you can get at Office Depot. Also scuttling around under the high-rises are Murdock's wisecracking buddy Franklin "Foggy" Nelson (Jon Favreau) and wisecracking Weegee-like crime photgrapher Ben Urich (Joe Pantoliano). Despite the cheesy dialogue and genre cliches, fun can be had at Daredevil. Primarily, the silver-tongued Jon Favreau has all the best lines, presumably because he wrote them all himself. Garner is beautiful and fierce, acting circles around the leading man with a minimum of smart scripting to help her. Duncan suitably embodies the brick-wall menace of the Kingpin. While a feral Farrell is way, way over the top as the snorting, heaving, eye-popping man-of-few-words Bullseye, you won't be able to take your eyes off him. Comic book fans will also buzz and bombinate over the frequent in-joke references to comic-book artists and two key appearances: one by film director and former Daredevil comic writer Kevin Smith and, natch, a Hitchcockian cameo from Marvel Comics godfather and Daredevil co-creator Stan Lee. In fits and starts, the story locates operatically scaled emotion, as with the affecting use of the romantic phrase "Stay with me." The major problems are two-fold: Ben Affleck and Mark Steven Johnson. Affleck's lanky, offhand softness hardly suits the superheroic archetype, and his acting ability isn't enough to overcome the basic miscasting. Worse, Johnson refuses to decide whether Daredevil is a campy, just-this-side-of-comedy romp like Batman Forever or a moody revenger like The Crow. The result is a noisy, murky mess of underdeveloped characters who are difficult to take seriously and action so overpowering it defies you to try to watch it. Each action sequence is a sensory overload with too-tight framing, dutch angles, quick-cuts, and strobing lights. If I were one of the hardworking cast or crew responsible for the elaborate fights--like Affleck, Garner, or action choreographer Cheung-Yan Yuen (of the upcoming Matrix sequels)--the spectacle of the obscured finished product of their labors might inspire some real-life vigilante justice. The R-rated Director's Cut of Daredevil deserves an extra half-star. With approximately a half-hour of added footage, everything plays just a little bit better. Matt Murdock is a more well-rounded character, more isolated and more actively heroic as we see him defend and investigate on behalf of an innocent client (Coolio). The fight scenes are given a bit more room to breathe and are thereby more coherent. Much of Jon Favreau's cutting-room-floor footage has been reinserted, and scenes that weaken Murdock's sense of isolation (confessions to the priest and a love scene with Elektra) have been excised. The Director's Cut has effectively supplanted the theatrical cut in the minds of fans and as the home-video standard (see review below). According to the rumor will, Marvel will revisit Daredevil in an Affleck-less reboot--the Director's Cut is a half-step in the right direction of taking the character a bit more seriously. 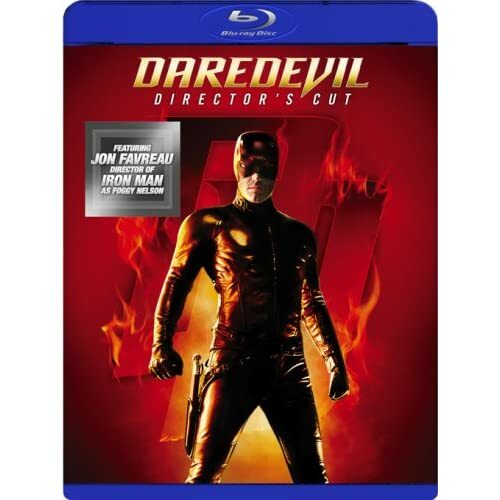 Fox has done right by Daredevil with its new definitive Blu-ray release of the Daredevil: Director's Cut. The only thing lacking on this fully-packed special edition of the preferred version of the film are the complete sequences from the theatrical cut that aren't in the director's cut (though they are glimpsed in a comparative featurette). This mostly dark and rain-glossed film gets a significant upgrade in image-quality on Fox Blu-ray: though not an image with the dimensional "pop" of reference-quality Blu-ray, colors are accurate and detail is fine for an exciting and best-yet rendering of the film. As for the audio, Daredevil gets the lossless treatment of DTS-HD, and this is a film with an immersive mix to benefit from the DTS route. Having not previously invested in Daredevil on DVD, I found myself mightily impressed by the Director's Cut package on Blu-ray. Aside from the significant improvements of the expanded 124-minute cut, the disc offers a monumental suite of bonus features covering the film's comic-book origins, development, production, and more. During playback, there's an Enhanced Viewing Mode in which an icon gives access to a multilayered behind-the-scenes look at the evolution of key sequences, all narrated by visual effects producer John Kilkenny, as well as the Fact and Fiction Feature offering production notes and factoids on story, character, and the Marvel Universe. An audio commentary by writer-director Mark Steven Johnson and producer Avi Arad proves surprisingly cordial, as the two pleasantly trade thoughts on the reasoning for and varying upsides to the theatrical cut and the director's cut. The jewels in the bonus-features crown are two hour-long documentaries. The first, "Beyond Hell's Kitchen: Making Daredevil" (58:51), is a highly entertaining and comprehensive making-of doc, covering how Johnson got the reins, the battles over the suit and its prototypical design variations, the cast and characters, fights, wire work, editing, effects, and music. This doc from the 2003 Director's Cut special edition DVD features comments from Johnson, Arad, Kilkenny, producer Gary Foster, costume designer James Acheson, textile artist Matt Reitsma, art department coordinator Jamie Neese, costume supervisor Lisa Lovaas, Paul Ben-Victor, Joe Pantoliano, action choreographer Master Cheung-Yan Yuen, Jennifer Garner, stunt coordinator Jeff Imada, Ben Affleck, Colin Farrell, Affleck's fight trainer David Lea, director of photography Ericson Core, sight-impaired consultant Tom Sullivan, Jon Favreau, special effects coordinator John McLeod, visual effects supervisor Rich Thorne, Shadow World fx lead Eric Horton, and composer Graeme Revell. 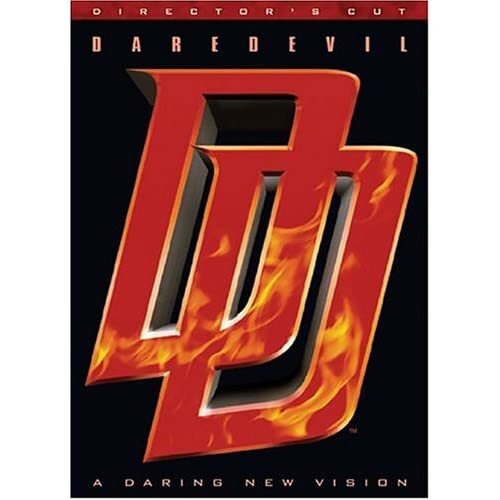 Even more exciting for Daredevil fans is "The Men Without Fear: Creating Daredevil" (59:15), a fantastic series of sit-downs with the most influential writers and artists in Daredevil's comic-book history: co-creator Stan Lee, Frank Miller, John Romita, John Romita Jr., Gene Colan, Joe Quesada, David Mack, Brian Michael Bendis, and Kevin Smith. Also quite important is "Giving the Devil His Due" (15:26), a featurette which sorts out the difference between the theatrical and director's cuts of the film, using clips and comments by Johnson, Arad, Foster and film editor Dennis Virkler. The very cool "Moving Through Space: A Day with Tom Sullivan" (8:28) takes us up close and personal with the film's sight-impairment consultant and his wife Patricia as they go about their daily lives and hobbies, demonstrating the opposite of "handicapped" inhibition. Less thrilling is the largely redundant HBO First Look special "Daredevil: From the Comic to the Big Screen" (24:50), though it's nice to see it included for completeness' sake. Hosted by Jennifer Garner, the show features footage culled from the same EPK interviews with Affleck, Arad, Johnson, Foster, Pantoliano, Duncan, Farrell, Lee, Favreau, Imada, Lea, Reitsma, Lovaas, specialty costumers Jill Thraves and Deborah Ambrosino. The disc refuses to quit, offering a funny Easter Egg Gag Reel (6:06); "Jennifer Garner Screen Tests" (2:31); "Featured Villain: Kingpin" (2:21), featuring an interview with Michael Clarke Duncan; Multi-Angle Dailies of the Daredevil/Kingpin fight and Elektra/Bullseye fight (3:18 with "Play All" option); a teaser and two trailers with a "Play All" option; three Music Videos with a "Play All" option (Fuel's "Won't Back Down," The Calling's "For You," Evanescence's "Bring Me to Life," and a "Music Promo Spot"); Still Galleries in the categories of Storyboards, Costumes, Set Designs, Production Stills, and Props; and "Shadow World Tour" (6:17), a still gallery claiming to offer "modelling sheets" but actually presenting the equivalent of trading cards, with character stats from the Marvel Encyclopedia. With the comic-book craze at full-bore, the Daredevil Director's Cut deserves a second-look, especially in the full HD of Blu-ray. All site content © 2000-2019 Peter Canavese. Page generated at 04/18/2019 03:02:31AM.